And Elisha said, “Borrow as many empty jars as you can from your friends and neighbors. Then go into your house with your sons and shut the door behind you. So she did as she was told. Her sons kept bringing jars to her, and she filled one after another. Soon every container was full to the brim! Relate: My random thoughts on the story of the widow’s oil actually skip ahead to another encounter that will happen nine chapters later. In this later event, Elisha is near the end of his life. One of Israel’s kings, Jehoaz, will come to visit him and when he realizes that the prophet’s end is near, he cries out in tears: “O my father, my father, the chariots of Israel and their horsemen!” Elisha tells the king to get his bow and shoot an arrow out an open window to the east. When the king does so, Elisha promises that Israel will have victory over Aram who is oppressing them. The prophet then tells him to take the arrows and shoot them at the ground. The king shoots three arrows into the ground and then stops. Elisha then gets upset at the king. Because he only shot three times, he will only win three battles. Had he emptied the quiver, he could have had a more complete victory over the enemy. 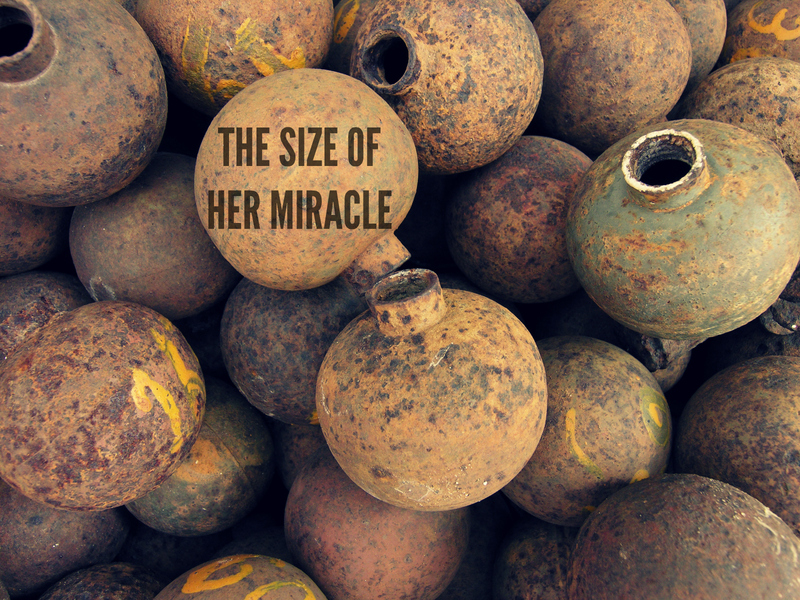 The size of his miracle was directly proportionate to his level of obedience. The same thing was true for the widow back here in chapter four. Elisha tells her to collect as many jars as she could. The size of the widow’s miracle was equal to the extent of her preparation. We don’t know exactly how many jars she gathered. We don’t know how hard she she begged, pleaded, or cajoled those jars from her neighbors. We don’t know how far down the block, or the blocks past that she went in her collection. What we do know is that as soon as the last jar was topped, the miracle stopped. React: There is a myth I often hear that God will not give us more than we can handle. Garbage. Being in over our head is the safest place to be. Peter couldn’t “handle” walking on any water. If God is giving us only what we can handle, it isn’t miraculous… it’s proficiency. On the other hand, there are times that this saying is true, but just not in the way we expect. For example, if a church does not have a solid process for making disciples, God probably won’t be giving them very many new converts. They wouldn’t know what to do with them. If a family doesn’t know how to handle and budget their finances, God probably won’t be sending any windfalls in their direction. It would be squandered. His oil goes in jars, it doesn’t get wasted into the dirt. With that in mind, there two questions I should be asking: 1) What am I praying for? 2) How am I preparing myself/my family/my church to be ready to handle God’s answer to that prayer? Almost always, the size of God’s miracle is a result to the extent of my preparation. God, help me to expect bigger things from You. Help me to put feet to my prayers. Help me to demonstrate that I really do believe You answer prayers by preparing to handle the answer You are waiting to give. Let my works demonstrate the growth in faith that You are working in my heart. Don’t let my lack of faith, expectation, or effort limit what You are going to do in my life. You are a big, big God. Let my actions and my preparations be a demonstration of how true I know that to be. This authors says, “Being in over our head is the safest place to be.” I would say I’m in over my head!! Safety! This is a very good post! I needed to hear this today! God I pray in agreement with her prayer in the name of Jesus! Oh! My apologies! 🙂 Blessings and peace to you, brother! What a fab – and so simple to “get it” – post! Thank you!! Most excellent! Always, always worth taking the time to read what you have written, and always worth looking for ways to apply what you say to our own lives. You are blessed, and you use your gifts well. So true! Reflecting upon my own prayers and how I’ve prepared to receive His response. I often hear that phrase about God as well and people actually believe it’s a scripture. (It is not) When I hear people use it, they or someone they are saying it to are experiencing a trial of some kind. When this is the case, I like to think that God won’t give us any more than HE can handle. We do our part and He does His. And I praise Him for that. Great post; thank you. Thank youuuuuu soooo much for sharing! Wow–that was a message for me today. Thank you for sharing. I heard Him loud and clear with that message. Bless you! An excellent explanation, Beejai! May God bless you increasingly! Alida. Thanks so much for this powerful post. I especially appreciate the accompanying song of worship. Your comments were the perfect follow up to the Verse of the Day, taken from Ephesians 3:20-21, I was greatly encouraged and challenged by your words. Thanks for the encouragement. I like how the top image is a bunch of hollowed out M67 Fragmentation grenades. Heheh. I’m a pacifist. How would I know? They look like a bunch of little jars to me. Normally they are filled with a composite C4 type. Then the primer with blasting cap is screwed into it. They are slightly smaller than a base ball. But the miracles they can perform are life saving and taking. Thank you! Great reminder that the size of MY miracle will be equal to that of MY preparation for it. If I have ever been in way over my head in a most impossible situation, it is NOW and all I say and do is Praise the Lord!! As He is up to something I am yet to discover, even though he did give a few clues! Hello brother the devotions you have written have been impactful in my life and right on time. and you have been an encouragement in my life! On my main site morningcoffeedevotions.com i am making a section called friends of morning coffee. Its a section where i want to help support people that have impacted me. for each person or persons i would give a little info with a picture of you or your blog and link to your websites. i would like to have you on there.